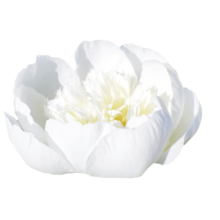 Paeonia Bridal Shower is a bullet-shaped peony, white as snow, with a wonderful fragrance. The buds may not seem to be as spectacular as those of Bowl of Cream or Elsa Sass, but bloom into a wonderful flower with a delightful fragrance and a fantastic shape. The flower has a diameter of about 15 cm and consists of fine leaves that circle around the centre in perfect symmetry. A very nice, subtle peony. Paeonia Bridal Shower is a variety that is similar to Duchesse while still in bud, but blooms a lot more fierce and has bigger flowers. The thousands of small leaves form into a perfect ball-shape. The inner leaves sometimes turn a bit yellow, although in practice it’s hardly noticeable. This peony variety was bred by Klehm in 1959, but was registered only in 1981. This peony is an excellent choice for a (bridal) bouquet because of its medium-sized bud. Subtly sized, fragrant and white. That’s Bridal Shower!